I carry my iPod Touch in my messenger bag back and forth from work. After walking, taking the train and a bus, there's definitely plenty of chances for the iPod to get jostled and potentially smashed against something hard. So I decided to make my own iPod case to help protect it. 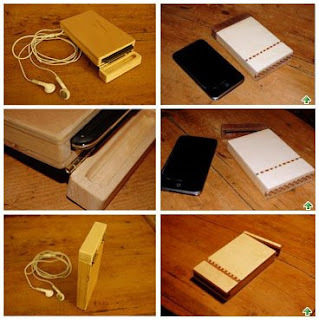 I figured wood would make a great case -- it is tough, attractive and easy to maintain. I was also sure I had plenty of scrap stuff lying around here and there in my workshop to put something together. Since it was only for when I wasn't using it, I decided I didn't need a window or any holes for earphone jacks to access it. I used some quarter inch birch plywood for the main sides and pine for the minor sides and ends. For the very bottom I put a false bottom which are connected to a pen spring I cut in half and mounted to the real bottom and the false bottom. This gives a shock absorbing bottom which should help in case of falls. After cutting the pieces, gluing them together and clamping it, there was just a few things left. I took my Dremel tool and sanded out the hinged top so it gave some extra room for the iPod. I had a couple small spare hinges which worked, but not exactly what I wanted. I ended up throwing on a coat of polyurethane to keep the wood iPod Touch case looking sharp too.